Seeing marigolds appear here and there around my neighborhood is something I look forward to every fall. It is believed that the scent of the flowers help guide the spirits to the altars. The yellow and orange marigolds symbolize the sun and light. These brightly colored blooms never fail to inspire me, so it was no surprise to me when I learned that marigolds symbolize creativity. For this week’s post, I looked a little deeper into the story behind this brilliant flower of October. The Greeks and Romans admired these flowers for much more than their beauty. They used marigolds to dye fabrics, treat various skin conditions, make cosmetics, and serve as seasoning in recipes. 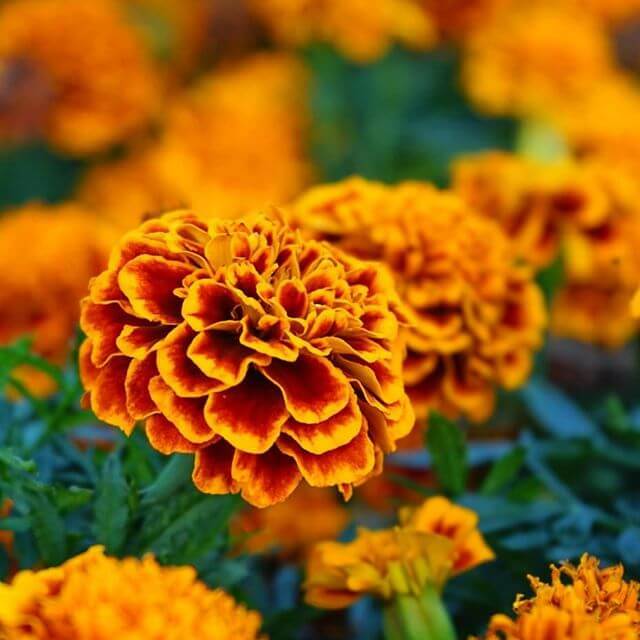 In Mexico, marigolds play a leading role in the annual Dia de Los Muertos festivities: People make garlands of marigolds and put them on the graves of their loved ones. 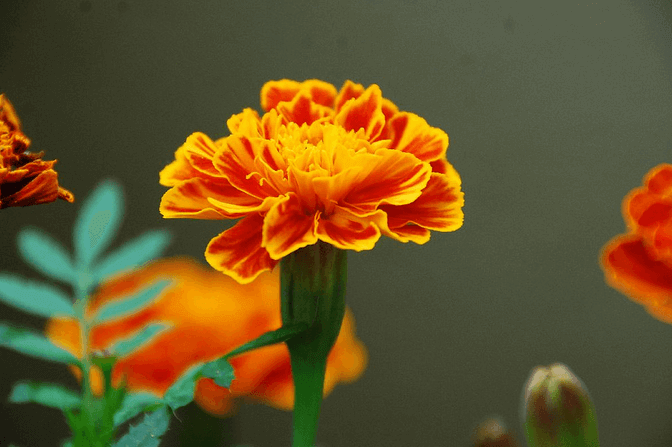 Where Do Marigolds Come From? Marigolds are from the Mediterranean, so it won’t come as a shock to you that they thrive in the heat and need lots of sunlight. These flowers are also plentiful in southwest Asia and western Europe. Choosing a color is probably the toughest part of caring for these low-maintenance flowers. Marigold colors include bright orange, yellow, gold, and white. I have a neighbor who has a line of pots on her front porch containing marigolds of every color. I’m with her: Why choose just one when you can have them all? She puts them in dark pots in order to highlight the brilliant colors of the flowers’ petals. After planting your marigolds in a sunny area, water your marigolds thoroughly. Allow the soil to dry before watering them again. Well-drained soil is best for these blooms. Make sure to water the base of your marigolds and not the petals, as watering the petals can cause mold. Deadhead your marigolds to spur renewed growth. The first colonists in America dried marigold petals, crushed them, and used the powder to color cheeses and butter. Marigolds symbolize passion, which is why many brides include them in their wedding bouquets, reception table vases, and other flower arrangements. Marigold was a popular girls’ name back in the 1920s. The young daughter of Edith Crawley on the popular television show Downton Abbey is named Marigold; the show is set in the early 20th century. Some people think that deer and rabbits are repelled by marigolds, but this is not true. However, while they are not repelled by them, they won’t eat them unless they are out of other options. Marigolds are a natural repellant to mosquitoes, and they are attractive to pollinating insects such as bees and butterflies. The petals of signet marigolds are a tasty edition to a delicious salad. They add a spicy element to the dish. Back in the 1960s, David Burpee, president of the Burpee seed company, campaigned to make the marigold the national flower. The marigold lost out to the rose for that title. Whether you plant your marigolds in your garden or put them in a pot on your patio, they will be large contributors to the swirl of fall colors around your home.